Previously a place of worship, subsequently a female only gym, the broad octagonal expanse of Tower Theatre’s new home in Stoke Newington has plenty of potential for a set designer, especially one tasked with creating the numbing sense of distance demanded by The Seagull. For this production of Chekhov’s bleak comedy of imperfect relationships and mediocre talents stranded in the middle of nowhere, Rob Hebblethwaite creates a wide, painted landscape across the back of the hall, to set up an opening scene in which Konstantin (Dominic Chambers) stages a play outdoors with the sweet, young Nina (Rachael Harrison) hoping for the approval of his self-centred mother and her entourage. After a strong opening, aided by Michael Frayn’s accessible translation and more particularly by Chamber’s excellently natural and rounded performance, this production starts to wane a little, but the amateur nature of the company is not without strengths. 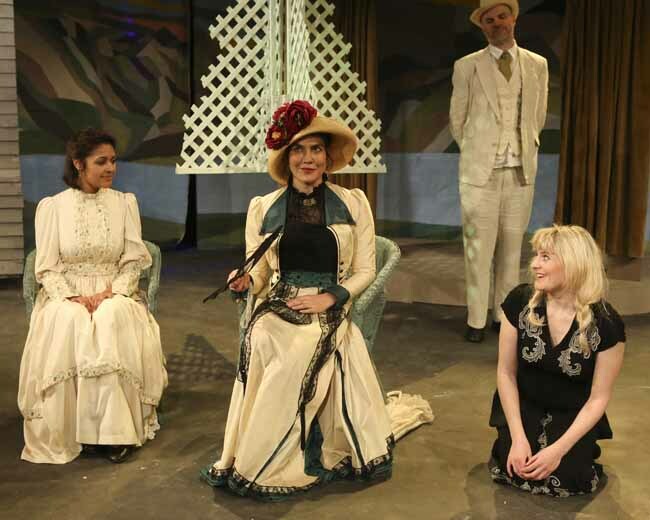 Chekhov’s characters are often better inhabited rather than performed and Tower Theatre’s long experience and large pool of members allows for some precise portrayals. As Sharayev, Richard Pederson is enjoyably boorish; Sorin is all too aware of his life’s inconsequentiality while perversely proud of his modest achievements, and Jonathan Norris manages this piteous balance effortlessly well. Even the tiny part of Yakov is entirely occupied by Alistair Maydon, stomping around like a man unaware of being on a stage. The more expressive central roles of Arkadina (Lucy Moss) and the successful writer Trigoran (David Hankinson) are harder ones in which to create the eerie naturalism that Chekhov’s dialogue allows. Both characters feel forced to start with, but they eventually settle down to deliver some compelling scenes; Moss and Chambers work together beautifully as the mother tends the son’s wounds and the way Hankinson as Trigoran succumbs knowingly to his own vanity and into Arkadina’s clutches, is engrossing. Though this is Julia Collier’s directing debut at the company, her experience in pantomime brings unlikely benefits. There is no sense of holding back on costumes (Lynda Twidale) or movement (Lindsay Royan) and the clarity of characters and storyline is refreshing. Her approach does the audience the favour of making the dialogue and therefore the relationships (or lack of them) easy to follow. The show could improve; the play’s delicately told but heart-rending story of Medvedenko and Masha, for example, seems to be missing in plain sight, but if the combination of am-dram and Chekhov gives you the chills, this production could give you a fresh perspective of both. The company succeeds in conveying the narrative with a clear voice and creating emphatic and well-fitting roles.